According to Gartner, more than 50% of marketing organizations use a data management platform (DMP), either directly or through an agency partner, and a vast majority of the rest feel they need one. We’ll explain why DMPs are so popular, how they help organizations, and also their significant limitations - they do not allow easy data ingestion and free data exploration. We’ll present an alternative technical solution for when DMPs are not enough to gain a deep understanding of your current and future customers. What is a Data Management Platform and how is it used in Data Driven Marketing? DMP solutions are used by marketers, marketing agencies and online publishers to execute on data driven marketing strategies. They gather audience data - collected in the organization or purchased from third parties, organize it and make it available to advertising and marketing automation systems. When not to use a DMP? You can leverage a DMP via an agency partner (making it unnecessary to purchase and implement a DMP within your organization). You can manage media buys directly from platforms like Google and Facebook. You have specific non-standard requirements for personalization. Your main goal is to optimize customer experience, not advertise on external platforms. You are subject to regulation as DMPs may not comply with privacy or security regulations; if so, you’ll need to manage data directly using a database or data warehouse. A data management platform performs audience data management--helping organizations, buy, sell and manage audience data. The data might include age, gender, location, interests, browsing histories, income, family size, opinions or anything else that could be used to target and advertise to consumers. How is audience data ingested into the DMP? Website tags - organizations can place a tag on their websites or mobile apps (like a Google Analytics tag), which sends user engagement data directly into the DMP. On-boarding for 1st and 2nd party data - customers provide their data and the DMP vendors help to import it into the DMP. In some tools it is possible to build custom integrations to ingest user data on an ongoing basis. Existing integrations for 3rd party data - DMPs provide numerous integrations with audience data sources. Via DMP integrations, it’s possible to click a button, and pull the data into the DMP, and automate bidding and purchasing of data from third party providers. Data Management Platforms take unstructured audience data and convert it into usable form. The DMP can parse data from 1st and 2nd party sources, organize it into segments and build audiences, which are compatible with advertising, targeting and personalization systems. A DMP can help you activate your data, by integrating with marketing campaign management platforms. You can define audiences in the DMP, send them to a marketing platform, and immediately run campaigns on those audiences. Retargeting and targeted display advertising - the DMP integrates with ad networks or retargeting networks such as AppNexus or AdRoll. It sends audience data and lets you target ads to those audiences. Paid search/social advertising - the DMP integrates with advertising platforms like Facebook Ads or AdWords, helping you target ads to audiences from your data. Content and product recommendations - the DMP integrates with recommendation engines such as Recolize or RichRelevance, helping you show personalized recommendations using audience data. Captures, stores and unifies all consumer data, beyond advertising. Segments audiences automatically using machine learning and artificial intelligence. Uses the world’s largest device graph to understand a customer’s unique footprint and deliver personalized messages on the right platform. Activates data across all touchpoints to optimize advertising, commerce and content. Identifies cadence of customer experience, and determines best time to engage. Access to transparent and trusted audience data sources. There aren’t many open source options in the DMP world. Two options are PimCore and Apache Unomi. Ingesting first-party data is a complex exercise - you’ll need help “on-boarding” or have to setup custom integrations. You can easily stream analytics data via tags, but this leaves historic data behind. Limited access to your data sources - DMPs do not make data ingestion easy. Most organizations today store customer data in multiple cloud services, and you’ll need to painstakingly integrate each and every one to see a unified picture in your DMP. Analysis capabilities are limited - most DMPs provide some analysis capabilities to identify audiences, but do not allow free exploration on the data, and do not integrate with BI tools. 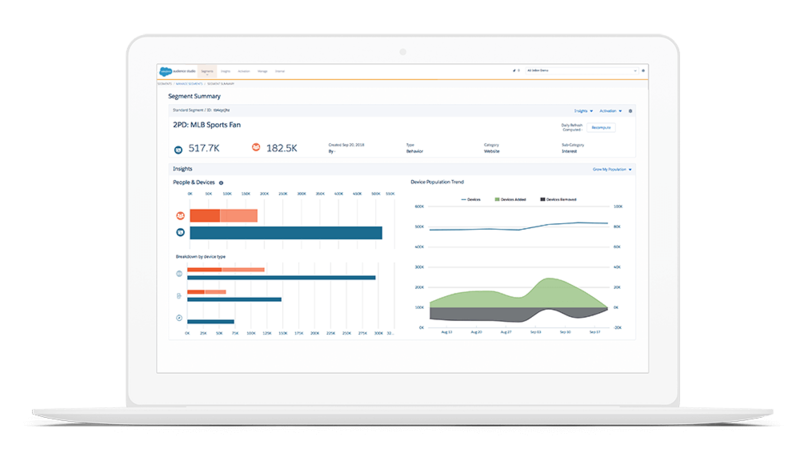 Ingest customer data at the click of a button from dozens of pre-integrated data sources - Salesforce, Google Analytics, Mixpanel, Stripe, Amazon S3 and more. Automatic data preparation and optimization - like a DMP, Panoply can automatically analyze data structure, apply schemas and data models, and prepare it for analysis. Close the loop from acquisition to revenue - you’ll need to combine data from first-part data sources to truly understand audiences and their ROI potential; Panoply lets you pull this data at the click of a button. Deeper insights with BI and free data exploration - Panoply connects to popular BI tools like Tableau, Looker and Chartio, prepares and optimizes data for exploration. Let analysts and data scientists derive deep insights about your audiences that a DMP cannot reveal.